In 1985 Victor introduced the compatible 3D VHD system. The 3D discs were backwards compatible, with the image playing as standard 2D on existing players, or in field-sequential 3D on the new 3D players (or players equipped with a 3D adapter via the AHD port on VHDpc players). VHD players with 3D built in had a button on the front of the player to turn the 3D on and off; they also had a mini-jack to connect the required LCD shutter glasses. Because the disc was backards compatible the formatting of the disc was not the same as a standard VHD. Victor achieved the compatible 3D disc by taking advantage of the "kick" instructions recorded on VHD discs for tracking control. Since two images are required for 3D, the Right Eye image is recorded on one field, and the left eye on the alternate field. This sequence is repeated, but for 2D playback, the Right Eye image is re-recorded on adjacent tracks along with the duplicated audio. When played on a standard player, the disc instructs the stylus to skip tracks every 1/2 rotation, thus playing only the right eye and giving a standard 2D image. In 3D playback, the stylus is also instructed by the "kick" signals, but at different points to skip over the repeated Right Eye image, thus giving 3D playback. In both modes the stylus is tracking in what is equivalent to 2x forward reproduction and so 3D discs are limited to 30 minutes play time per side. One neat point of the 3D disc engineering is that VHD players from different manufacturers respond differently to the kick pulses on the disc - in other words, when a kick instruction is received, not all styluses kick at the exact same point. This could cause problems with the audio if, for example, the disc playing in 2D read the audio from the unneeded Left Eye signal. To overcome this problem, Victor records small amounts of repeated audio at points where the stylus would kick - enough audio is recorded to cover all variations of players. If the stylus goes off track, the repeated audio is there to "fill in" the gap and no audible artifacts are generated. Victor, National (Panasonic) and Sharp all produced VHD players with 3D built in, and I've also seen a 3D adapter from Sharp, but I don't know if Victor or National produced 3D adapters. While the 3D revolution was short-lived in Japan, Victor managed to release a good number of titles on VHD in the 3D format. All widescreen films were letterboxed and in stereo when applicable. They also released some anime in 3D. The following is a list of titles that I know for sure to have been released in 3D on VHD. There may be others, but I've never seen a definitive list. 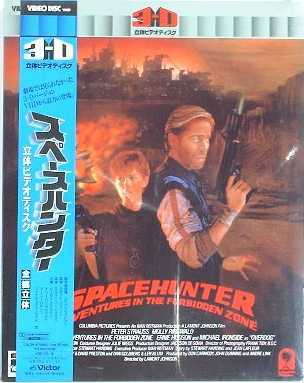 Note about 3D videotapes of these movies: Many people either own or are selling 3D VHS copies of the above movies. All come from the 3D Magic Corporation (formerly 3DTV) and were duped from poorly cared for VHD discs. In addition, the VHD player wasn't a true 3D player but was equipped with a 3D adapter and thus there are field-errors as the stylus tried to read the correct tracks. The Jaws 3D tape has color-banding on the right eye image due to a worn stylus and skips in several points - some copies have whole scenes missing. Stereo is on some copies, but 3D Magic got "lazy" when duping the tapes and the sound suffers - many copies are mono. In addition, most tapes out there are dupes of dupes and have color spill and many other problems. When purchasing a 3D VHS tape of any of these titles, ask if it was copied directly from the VHD disc - if not, beware. 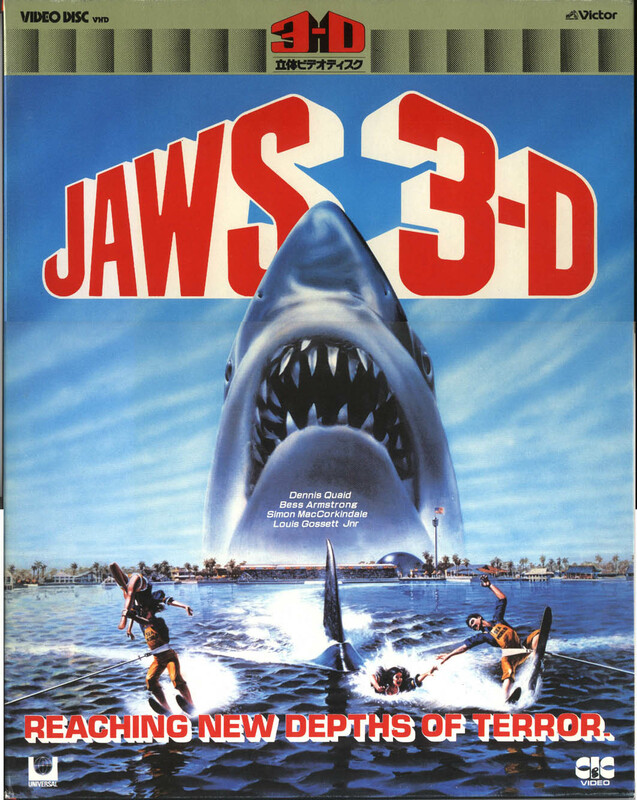 If you are interested in high-quality, direct-from-disc, VHS or Super VHS copies of Jaws 3D, Friday The 13th or Metalstorm, please contact me directly for information.